Digital loyalty programmes and electric vehicle opportunities. Electric Vehicles – a new opportunity for retailers? 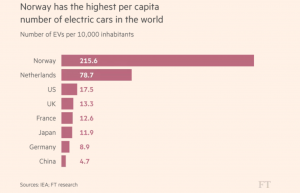 Like much of the media hype that accompanies innovation, the increasing presence of electric vehicles on our roads globally is accompanied by fear-mongering and predictions of the demise of convenience retail. A recent report by Morgan Stanley raises the idea of the ‘gas-less gas station’ – a place where customers may (or may not) choose to stop if their re-fueling/re-charging needs are already being met at home or at work. This is a challenging idea still in many markets including the USA, where electric vehicle adoption is still less than 0.2%, however China and Norway are two countries already adapting to electric vehicle driver’s needs, boasting the greatest overall numbers of electric vehicles and greatest penetration of consumer vehicles respectively. In this article, we examine the factors that are driving the adoption of electric vehicles, as well as lessons that can be learnt from the success and leadership in Norway particularly where 10% of vehicles now in use are plug-ins, along with some ideas how Norwegian convenience retailers are taking advantage of associated changing consumer behaviours. Vast oil reserves have made Norway (according to new calculations) now the world’s wealthiest country, yet it’s also renowned for its socially-supportive government policies. As well as the world’s largest sovereign wealth fund, Norway also topped the 2017 United Nations ‘World Happiness Report’ given the quality of life it creates for its citizens, so it’s undoubtedly a forward-thinking economy that many countries can learn from. When it comes to electric vehicles, government policy in Norway has been single-minded from the start. The list of benefits for drivers range from huge savings at the time of purchase, to “perks that can be worth thousands of dollars a year” – such as free tolls and free parking and the benefits are not just financial. Electric car drivers can also use some of the nation’s bus lanes – a perk that saves time as well as money. For now these perks are government-subsidised, but industry commentators such as Opel’s Chief Executive have estimated that with the mass market now converted, the sector will be capable of sustaining itself by 2025 – 2030. While forecourts have historically required highly specialised infrastructure, it’s clear that electric charging stations are much simpler to install and operate. An increasing number of public places such as supermarkets, hotels and hospitals are installing charging facilities that tempt customers with free charging to visit. In Ireland for example, Lidl supermarkets – a discount grocery chain recently announced the nation’s largest network of electric vehicle charging points – positioning it as a benefit to customers (it’s free to charge), as well as a positive, environmentally-focused business initiative. In the meantime, convenience retailers have been quick to spot the opportunities that are being created by longer dwell-times as well the adoption of digital/app technologies that driver’s use to monitor and manage their motoring. 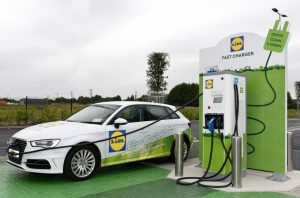 Lidl in Ireland is expanding its charging point network as a selling point. Locate stations on highways where long trips are expected – in particular “dense urban corridors with heavy ride-sharing traffic”. Add electric super-charging stations to existing fuel pumps to become the destination for early adopters. Expand food and retail offerings to include maintenance services that can be accessed while charging. Morgan Stanley predicts such improvements “could boost station retail sales by 10 – 20%”, and their predictions are supported by the fantastic example unveiled in January 2018 by our friends in Circle K in Norway. An interesting article by Global Convenience Store Focus describes how “food and drink sales are up by 25%” with this impressive new format, which is also showcased in the video below by Retail Vision. 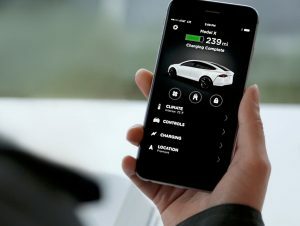 Electric drivers need up-to-the minute information about their car’s charge status and range as well as ‘charging complete’ notifications, so electric vehicle drivers are typically smartphone users who use the car’s app extensively. This means that there is already a direct digital relationship with these customers, which can be highly beneficial if used strategically as part of your overall marketing communications platform with customers. We’ve previously discussed how apps are driving operational benefits to both retailers and customers with some of the world’s biggest brands driving adoption of pre-order and pre-pay solutions to minimise coffee queues. Electric vehicle motorists such as Tesla drivers now enjoy a whole range of additional user benefits beyond the basic charging information, solving everyday driver needs in entirely new ways. These benefits are so simple and useful that it’s likely that many other car brands will increasingly offer similar functionality regardless of what fuel the car uses. Restrict access to your vehicle when handing over to valet – for example limiting maximum speed and locking your front trunk and glove compartment to safely conceal valuables. The Tesla App offers a whole range of additional benefits for drivers. The actual charging companies who provide the infrastructure for the charging stations – and have the most direct access to users in order to take payment etc. Revenue opportunities for these service providers include the provision of digital marketing and media services to customers via the payment app, alongside more traditional poster-style campaigns on the charging units themselves. Many foodservice operators such as McDonald’s are also tapping in to electric vehicle driver’s needs with recent announcements including the installation of charging services nationwide in drive-in restaurants throughout The Netherlands – the country with the highest density of charging units currently. Other facilities such as hotels are installing electric vehicle charging in order to attract these drivers as overnight guests and even existing cars parks are becoming smarter to advise drivers on charging points, as well as other digital enhancements including monitoring space availability and where cashless or frictionless payments are also available. No matter what, with the dramatic adoption of electric vehicles globally, there’s no doubt that drivers are becoming increasingly dependent on digital apps for every aspect of their lives, creating opportunities now for forward-thinking and innovative retailers to connect with them as an essential element of their business strategy.